New basic military training housing at Joint Base San Antonio-Lackland is on pace to be ready some time late this summer, according to a press release from the base. The $900 million dollar project has been under construction since 2009, but it looks like it’s going to be worth the wait. The Air Force is constructing four airmen training complexes and two dinning/classroom facilities to replace eight housing and training buildings built in the late 1960s and early 1970s. The old basic training facilities apparently were scattered around Joint Base San Antonio-Lackland, but the new facilities will consolidate BMT into a central area, housing up to 1,200 trainees, according to the press release. 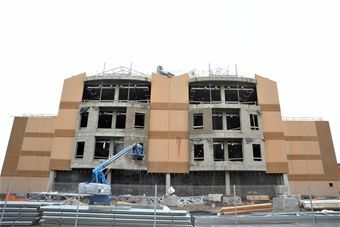 The construction that will be finished by late summer, is the first phase of the project known as the east campus. Plans have also been designed for a BMT west campus. That part of the project is expected to be complete some time in 2018, according to the press release. Please forgive my interruption, but I am a veteran, grad student and I am doing research on the relationship to multiple deployments, combat, and injuries. If you are an OIF or OEF veteran would you take time and fill out this survey. It is anonymous, information goes directly to Ohio State’s computers, and I only get the data. Take care and thank you.